I know, holy crap, it’s been like eight months since I’ve said anything, and even longer since the last review. I am like some kind of horrible person or something, especially since this update is mostly to let you all know that I’m participating in this year’s National Novel Writing Month*. If you feel like adding LoopTheLup as a writing buddy, feel free; if you want to take to the comments section and berate me for not writing more reviews, you may also feel free. I do apologize. * I have never quite gotten used to the name “NaNoWriMo,” as it conjures up strange mental images of an infinitesimal fraction of a WriMo. If any of you happen to know what a WriMo is, please tell me. So I’m sure you’ve all heard about the perilous situation in Japan at the present time. Thousands dead, even more injured or homeless or otherwise in dire straits, and a nuclear power plant on the verge of a meltdown. There are numerous charities directing aid to those currently in crisis, such as the International Red Cross. I’ll also endorse Save the Children, a charity devoted to helping children in need, all around the world. You can see the main areas for their efforts here. They also offer a program where for a certain amount each month, you can also sponsor an individual child and provide them with the help they need while growing up. Natural disasters like this are painful and destructive reminders of how fragile human existence really is—but they are also an opportunity to show how strong and bright the human spirit can shine when people work together to help each other out. So here’s a chance to shine. If you cut off the word before it’s complete, it’s not really dirty. So I work closing shift at a call center. It’s a highly challenging job, and I still haven’t learned how to make myself properly stop caring*. 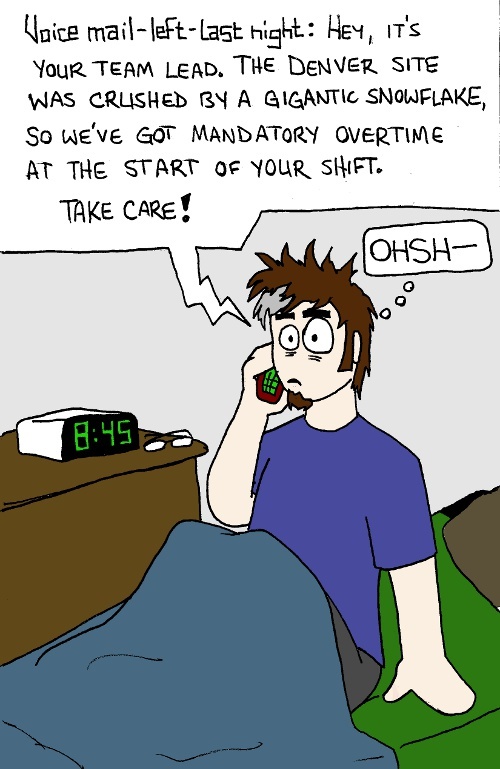 And then there’s the difficulty that comes with mandatory overtime being added to people’s shifts whenever the call volume is overwhelming and staffing isn’t enough to keep up with it. I’m just lucky my wake-up alarm is on my cell phone, or I would have missed the message entirely and gotten late-points added to my attendance record. * The difficulty of working customer service is that you have to care for the customer without caring so much about them that every call makes you want to cry. And when your power to resolve things is mostly limited to telling other people what happened, it gets … painful. A quick little treat for those of you still reading, based on a reading blooper at work. I commented in team chat that it was pleasantly slow, seeing as it was two and three minutes between calls for once, and one of my co-workers thought I’d said it was “pleasantly snow” instead. This had to be drawn. Here’s wishing all of you a pleasant holiday season. Those of you who remember back when I was churning out reviews once a week will recall that spelling is something dear to my heart; it’s one of the things that I will invariably pick on in a comic. Frankly, I’m a bit of a snob about it, since I was one of those insufferable spelling-bee champions back in junior high school. So I might as well make my social loss your gain, right? While I can’t personally offer any suggestions for how to fix English’s predicament, I can at least offer perspective on how it got there. My college studies included a few overviews of the history of English, and . . . to make a long story short, English is not a purebred language. It was born when Old Germanic and Latin had a one-century stand on some backwater island north of France. Their illegitimate child was a mutt to the core, displaying spelling and grammar traits of both languages. The parent cultures couldn’t stand the look of the child, so they left it to die, alone, on the island. Then French took a shine to the poor young thing when William the Conqueror arrived. It was a sad and horrifying tryst, considering the relative ages of the language, and English would never fully rid itself of the taint from that relationship. A certain je ne sais quoi remains to this day. Perhaps as a result of this abuse so early in its life, English has displayed a voracious appetite for conjugal relations with other languages. Every time the English language encounters a new culture, it takes that language for all it’s worth. The pederast French, on the other hand, pooh-poohed the entire affair and set up a sanctimonious Academy in order to deny the effects of any further dalliances. In short, English is so messed-up because it is a dissolute whore. But don’t lay the blame at its feet—the poor language is a victim of circumstance.